Shadow Souls is the second book in L.J. Smith 's ever-popular Vampire Diaries Return series. Picking up immediately after Vampire Diaries Return: Nightfall ends, Elena Gilbert and gang travel to another dimension -- the Dark Dimension -- in an effort to save Stefan Salvatore from his imprisonment. Elena must find two halves of a magic key that will unlock Stefan's cell but in the process, she must pose as a slave to Damon Salvatore in the Dark Dimension, where supernatural leaders rule. As Damon teaches Elena how to control and exercise her newfound magic powers, she finds herself once again torn between trying to decide which Salvatore brother she ultimately wants to be with. As a fan of L.J. 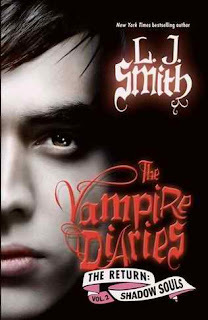 Smith for years since the release of the first Vampire Diaries: Awakening in 1991, I am extremely disappointed to say I am not enjoying the Return series -- at all. Shadow Souls is twice as long as it should be, which I suspect is in an effort to mirror the tiring and unnecessary length of Stephenie Meyer's Twilight books. In addition, new plots and story-lines are introduced but not developed, making Shadow Souls in its entirety far too busy; although it does leave much open for the third and final book in the Return series. The concept of Elena having to constantly struggle with choosing one Salvatore brother over the other has been long overdone at this point and the novel loses its charm further when Smith removes us from the enchanting and familiar setting of Fells Church, Virginia. I do not recommend Shadow Souls to anyone -- including die-hard fans of Smith and her Vampire Diaries series! As a long-time fan myself, I believe I would have been better off had I not even delved into the Return series. The final book in this Return series is Midnight .